On today's post, I want to share with you the completed Harvest Scrapbook Layout from my Cricut Thursday Sketch posted on August 28, 2014. I created the first page layout as outlined on the directions provided and added a second page to complete the double page layout. 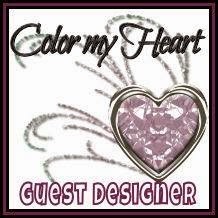 In addition to the cardstock used, I added some Clear Sparkles that I colored Golden Yellow using the ShinHan Alcohol Marker Y222 available through my Close To My Heart website. 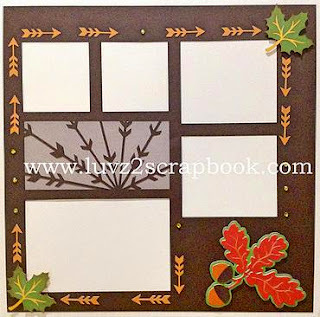 All products used on these layouts are available through my Close To My Heart Website at www.luvz2scrapbook.ctmh.com. 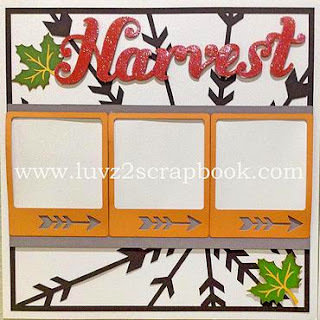 If you have any questions regarding the materials used and directions, feel free to email me at luvz2scrapbook@gmail.com.